EA Sports has announced the ratings for the top 10 rookies in Madden 16. The list includes fan favorites such as Marcus Mariota, Jameis Winston, Kevin White, Todd Gurley and more. You can check out the list courtesy of our friends at Madden-School.com below. WR Amari Cooper – 82 overall: In addition to his rookie-best 82 OVR, he brings 92 Speed, 94 Agility, and 87 Catching. QB Jameis Winston – 81 overall: Winston really impresses with 95 Throw Power and rookie-best 88 Throw Accuracy Short. He’s a threat to run with 81 Agility, 75 Strength, and 73 Speed. 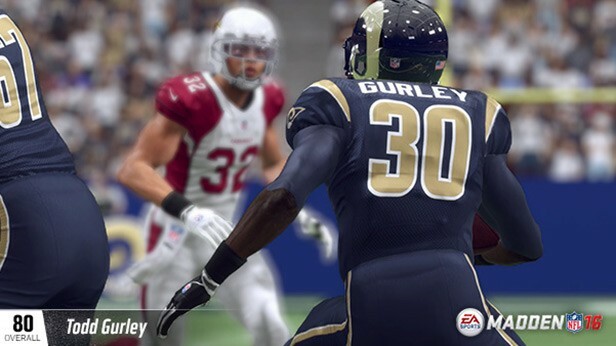 HB Todd Gurley – 80 overall: Gurley has the quickness with 91 Speed, 87 Acceleration, and 80 Elusiveness. The power shows up with 91 Trucking, 89 Stiff Arm, and 91 Carry. Just watch out for that 73 Injury Rating. LE Leonard Williams – 80 overall: Williams brings excellent 90 Block Shedding, 87 Strength, and 85 Power Move ratings to beat offensive linemen. He also has 83 Pursuit and 82 Acceleration to get to the quarterback. RT Brandon Scherff – 80 overall: Scherff won the Outland Trophy at left tackle, but he’ll play right tackle for the Redskins. He tops all rookie offensive linemen with 89 Run Block, as well as 83 Strength and 80 Pass Block. RE Dante Fowler – 79 overall: Fowler excels at edge rushing with 86 Speed, 89 Acceleration, and 83 Pursuit. He’ll get around linemen with 83 Finesse Move and 84 Agility, as well as 87 Tackle. HB Melvin Gordon – 79 overall: Gordon is an even better speed back than Gurley with 91 Speed, 88 Acceleration, 80 Elusiveness and 91 Spin Move. His 69 Trucking limits his inside runs, although he has 83 Stiff Arm. WR Kevin White – 78 overall: White has big shoes to fill following the departure of Brandon Marshall, but he’s a deep threat with 94 Speed, 92 Acceleration, 88 Agility, and rookie-best 88 Catching. QB Marcus Mariota – 78 overall: Mariota is a double threat with 87 Throw Accuracy Short and 88 Throw Accuracy Mid, as well as 90 Throw on the Run, 88 Speed, 90 Acceleration, and 79 Elusiveness. RE Vic Beasley – 77 overall: Beasley is another quick edge rusher, but he backs it up with 87 Strength. He’s coming around the end with 88 Speed and 89 Acceleration. To knock down passes, Beasley brings rookie-best 92 Jumping. You can check out the entire Madden 16 ratings article with screenshots and videos over at Madden School.